Brushy mum had a nasty hip injury. But with a flat furred baby in her pouch she was kept as comfortable as possible in a small aviary. Mum didn’t move or eat for 4 days but baby was more adventurous and came down to feed from the fruit bowl. Mum then started eating well and lived in a house on the floor of the aviary. 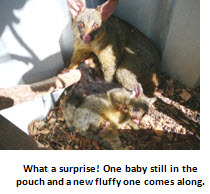 Two weeks later I was brought a 450g baby brushtail and I considered whether it might be possible to put her into the aviary with mum. The new baby immediately started suckling and was accepted by mum with no complaints. I even saw mum with the little one in the pouch and cuddling the second baby. 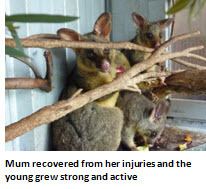 Mum recovered from her earlier injury and the time for release of the young approached. They were taken to my release aviary in a beautiful bushy area. When the door was later left open for them to self-release mum went off like a flash, having had enough of rearing two bouncy young. However the two juveniles took up residence in the aviary and refuse to leave. They go out each night to forage but return “home” to sleep.